Bollywood actor Kartik Aaryan has been riding high on success ever since the release of ‘Sonu Ke Titu Ki Sweety’. However, it looks like Kartik and his team have to learn to hold their horses! 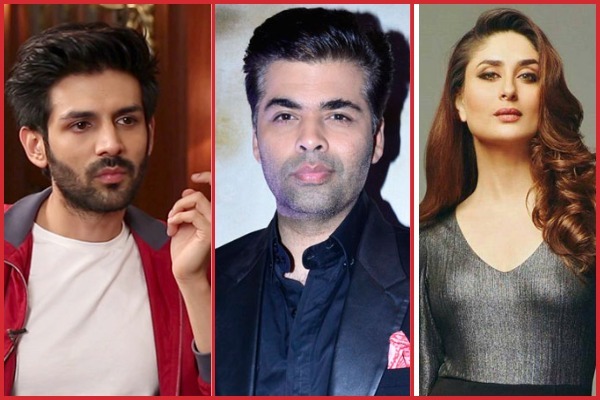 As per reports Kartik Aaryan has been dropped like a hot potato from Karan Johar’s Dhrama production’s project due to a slight tiff with the producer. A source from the Dharma Productions revealed to The Deccan Chronicle that Kartik was in the talks of playing the second lead in a film starring Akshay Kumar and Kareena Kapoor Khan. As per the source, upon seeing the possibility of even featuring in a Dharma project Aaryan’s team released a report stating that the actor has been signed by Karan Johar, which obviously left Karan Johar infuriated. The report further served with some spice that Kartik Aaryan was going to paired opposite Kareena Kapoor Khan. However, the trusted source cleared up the confusion by stating that Karan had never signed Kartik for a project but had only sent him feelers, but it was nothing concrete and also that the actor was supposed to play the second lead in the film! In fact, Kareena Kapoor Khan was paired opposite Akshay Kumar and not Kartik Aaryan in the Karan Johar produced film. We Bet Kareena Kapoor Khan’s Son Taimur’s Teary Eyed Pictures Will Steal Your Hearts! Clearly this incident has left a sour taste in Karan Johar’s mouth. No wonder Kartik Aaryan was dropped from the project so abruptly. The same report also stated that the film will feature a lot younger couple in the movie— perhaps this was the role offered to Kartik Aaryan? Previous : Shahid Kapoor And Mira Rajput Buy Relief Worth 56 Cr From Prostitution Menace!